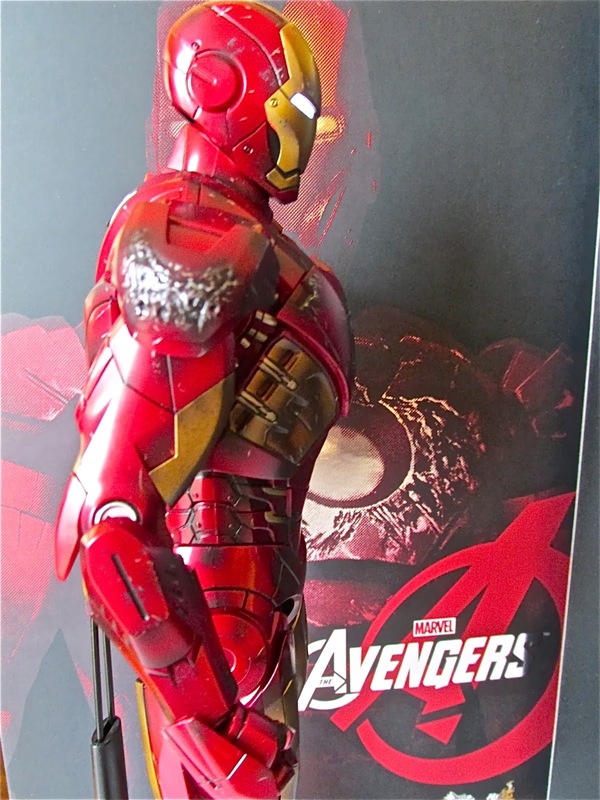 With the coming of War Machine Mark II from Hot Toys, I decided to take a long overdue look at Hot Toys special movie promo edition of the Mark VII armor from The Avengers line from Hot Toys. 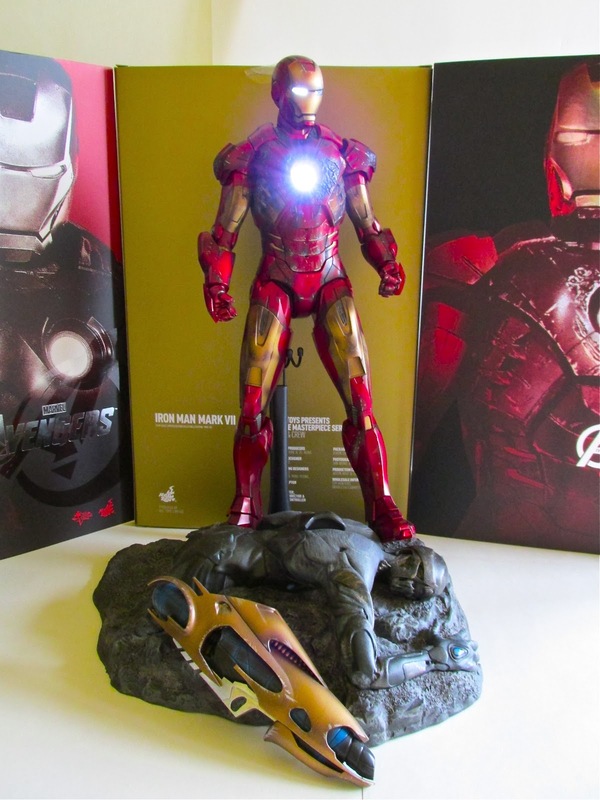 This special edition of the Mark VII came as a special release to promote Iron Man 3…of course in true Hot Toys release fashion this came out nowhere near the May 2013 release of Iron Man 3. Still, this is a great figure to behold. This figure is essentially a repaint of the Mark VII that came out earlier and does not come out with the switch out shoulder pads or thigh armor. This is accurate since this battle damage version is the one seen at the end of The Avengers movie when Tony falls out of the worm-hole. 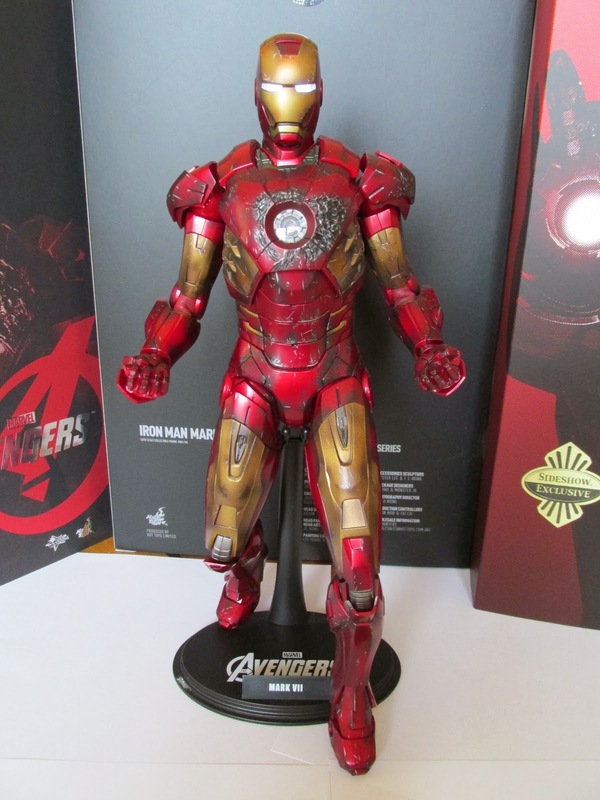 With that in mind, this is a bare bones figure of the first Mark VII release, however, it does stand on its own and is a great piece to add to your collection. 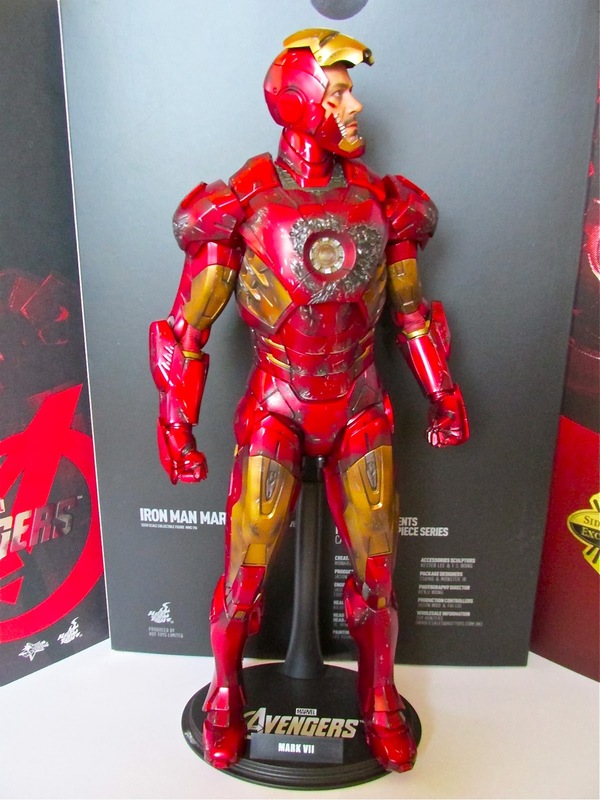 First off, the paint job is what really makes this figure shine and stand out from the original Mark VII. If you take a closer look, you can see that the armor is severely scratched up and adorned with scorch marks. The paint also gives a real weathered and beaten up look that makes you believe that this armor just survived the battle with the Chitauris. Speaking of the Chitauris, this figure comes with a brand new base featuring a fallen Chitauri. The sculpting on this is one reason why to get this figure. 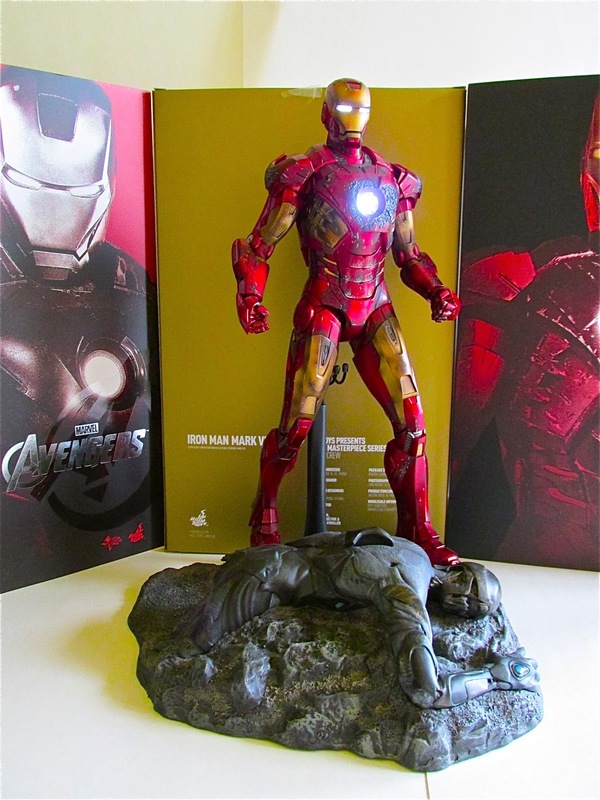 It is a great piece for any of your Avengers to stand on, and it even comes with a Chitauri gun, which was also released with Captain America. It can be kind of hard to have a figure stand on this base since there isn't a clear, defined place to put it. I just have one foot on the Chitauri hand and the other foot on a rock next to the Chitauri head. Otherwise, Hot Toys leaves it to you how you want to have your figure stand. Accessories wise, this figure comes with two arm rockets-one for each arm, a head sculpt of Tony Stark in his helmet, and the usual array of hands. Nothing too special here, except for the head sculpt. This is a great sculpt of Tony and of Robert Downey Jr. and probably should have been used with the original Mark VII release. 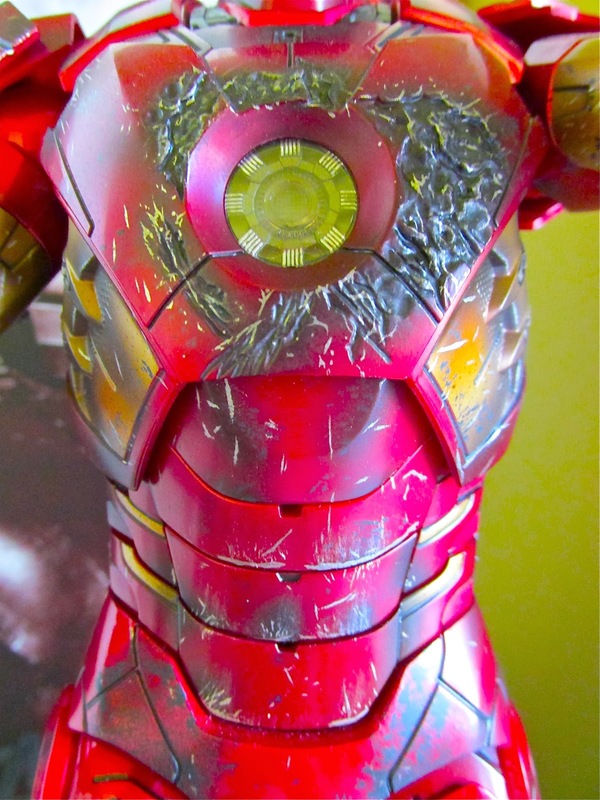 The face plate sits in place on top of the helmet to reveal Tony’s face. The one thing to look out for is the magnet. My magnet on one side of the face plate came off, and I had to glue it back on. If you had a chance to get this figure, then you are one of the lucky ones. This is a great addition to any collection especially if you are collecting every piece of armor that is coming out from Hot Toys. Stay tuned for Midas!